CreditCardFAQ.ca offers information on various types of credit cards to help customers avoid crippling interest rates, hefty fees, and other debt dangers. CreditCardFAQ.ca (http://www.creditcardfaq.ca) was launched today to help visitors from all walks of life learn more about Canadian credit cards and make an informed choice. The website was created by the web design and development team at CreditCardFAQ.ca and presents popular credit cards, grouped by common features: low interest rate, air miles and rewards, no annual fee, and others. “Canadian consumers have an incredible array of credit card choices, and the goal of CreditCardFAQ.ca is to make it easy to choose one that fits their lifestyle,” said John Williams, marketing consultant at CreditCardFAQ.ca. Some people forget that credit cards are not created equal. There are many snares and traps that make it difficult to choose the right product. Issuers profit from the interest rate and fee structure, and cardholders often end up with a plastic monster that costs them a lot of money. Many finance companies feature bait-and-switch offers and pay for commercials such as “Take credit for less”, “Spending has never been so rewarding”, and “Don’t leave home without it”. Customers are tempted by zero percent offers, generous rewards, insurance policies, and other perks. They pay for purchases, expensive items, gas, and gifts, and no cash leaves their pocketbooks. Then the bill arrives, and they realize that debt is difficult to handle. Once the introductory offer has expired, customers receive letters notifying them of interest rate hikes. Unconscionable interest rates, inactivity charges, and hefty late payment penalties put a lot of people in debt. The amount they owe gradually increases while banks and finance companies make maximum profit. Borrowers often lose their sleep. And debt triggers strong emotional responses such as anger, depression, panic, and denial. Financial problems are usually self-inflicted. CreditCardFAQ.ca helps borrowers to avoid credit card traps and the negative consequences associated with them. The website offers in-depth information on cashback, airmiles, low interest, gas, and other credit cards to help visitors make responsible and smart choices. 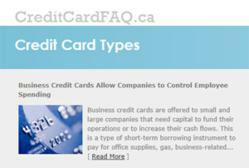 About CreditCardFAQ.ca: CreditCardFAQ.ca is a website focused on offering free information on Canadian credit cards.